From the range of Quasar Control solutions, Quasar Control Utility Edition (QCU) is a powerful, highly flexible "Control Engine" providing intelligent load control. QCU puts you in control of your network and provides you with an intuitive and easy to use interface backed by industry leading functionality. Configuration for all components of the system is available putting you in control of the setup, maintenance and day to day management of load control. All configuration is supported by a comprehensive user guide. Interval Control Management is user configurable to ensure your equipment is shed/unshed in an orderly fashion, protecting your site from sudden power drops/surges and ensuring a general smooth operation. Target models are created allowing specific targets for specific periods, dates and days of weeks. Multiple targets can be created and setup for different date ranges or targeting specific groups of devices. Targets are also broken down into 30 minute intervals but are configured by exception so that the setup is very quick and easy to view and understand. Also available as an option is support for redundant communications meaning if one communication medium fails, the system can choose alternate methods to manage the important functions of your equipment. The Data Interface provides the ability for Quasar Control Utility Edition to perform as a slave meaning external systems can read and write to Quasar Control and see/control information including system health, status, individual device information, targets and much more. Examples are SCADA systems, External Reporting Systems and any other system that supports the protocols provided. By default, this is provided with DNP3 protocol. Optionally, Modbus RTU/TCP is available. The graphical dashboards have been designed to be user friendly, easy to navigate, highly configurable and enable quick access to load control information. When not logged in, the dashboards can be configured to automatically display as a slideshow. 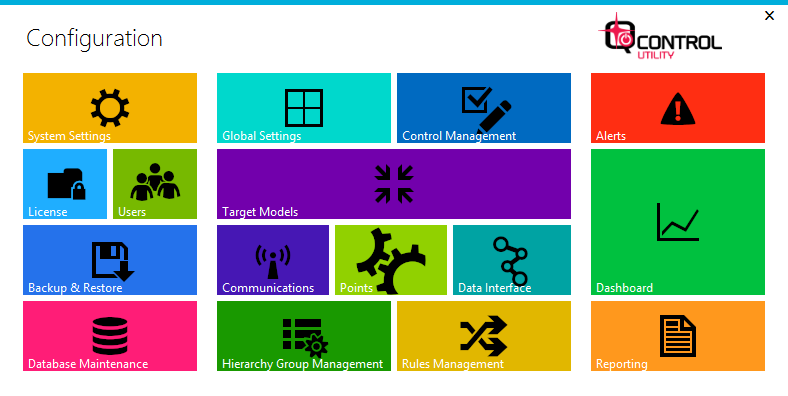 With an extensive library of drag and drop dashboard objects available, all your dashboard requirements will be met. The reporting tool provides a range of scheduled and ad-hoc reporting that is easily tailored to suit business requirements. These reports can be viewed, exported or emailed automatically as required. The Reporting Package Compiler can pull together all the reports you want, along with external documents into a single report. Once setup, the Reporting Package Compiler minimises the effort required to produce regular presentable reports to the respective audiences. Reports are also able to be exported in a format that can be utilised by other programs if required. 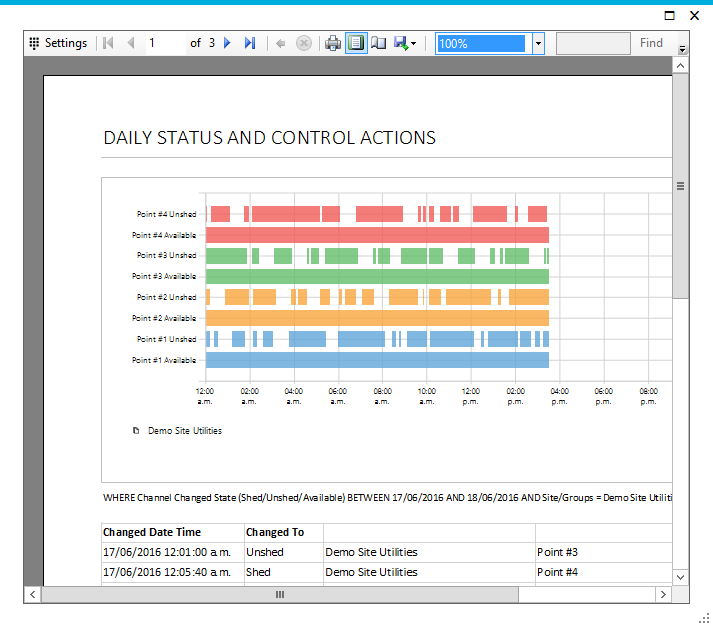 Quasar Control Utility Edition supports dual redundant systems with health status reporting. This enables you to run a standby system which can take over full control in real time when the active system fails for any reason. In addition, the health and status reporting enables any external SCADA systems to fully understand the state of the redundancy and which system is currently responsible for control. 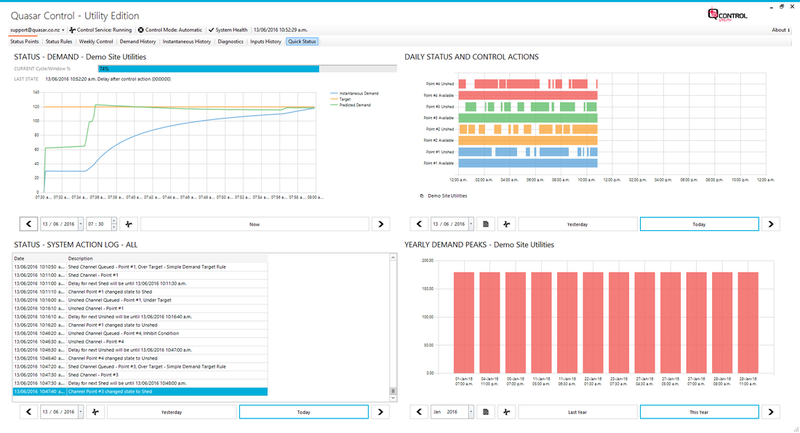 ﻿﻿﻿﻿﻿﻿Quasar Control Utility Edition (QCU) is available at 3 levels to suit your business needs. For a free trial, please contact us.